After a few, intense days in Patzcuaro, here we are back in D.F. It’s being such a nice experience, the country is treating me very well and I am getting more and more into the culture; I have to admit that I am fascinated by the Mexican capital. In Mexico if you want to say that something is cool, you just say: esta’ (it is) “padre” – you will listen to this adjective everywhere and in different socio cultural contexts together with the word “wey”; in Anglo-Saxon countries its translation could be dude, bro, while in Argentina could be used as their “che“. 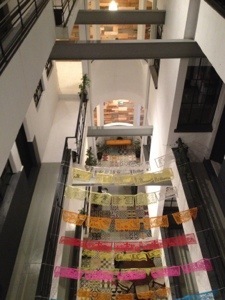 I moved to a newborn hostel: Stayinn Barefoot: a lovely and with a cool design cozy place located in one of the best areas in D.F. 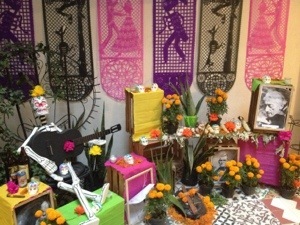 : La Condesa. Both Colonia Condesa and Colonia Roma have fascinated me. Colored houses, a bohemian hint and lovely bars and shops. But the experience at this hostel was overwhelming. A happy traveler must travel lightly so I decided to ship the rest of the stuff to Italy. I reduced my initial 20 kilos luggage and left all my stuff in DF from now on I would travel with just a little 10 kilos backpack. What I liked most of Barefoot was the colorful environment, the young and energetic personnel, always ready to help and giving precious local suggestion on what to do and up to resolve the most bizarre questions. The style is minimal, the design is cool and it is not how you would imagine a place where you can sleep for about 15 dollars, with decadent bathrooms and drunken teenagers. At this hostel I met amazing people from all over the world running away from their own routine and comfortable life and living the jungle for a while. The energy is super strong. Even cleaning ladies are smiling and buena onda; they work all day long cleaning all floors and is thank to them that dorms, bathrooms and the kitchen are always immaculated. Of course they are helped by the help of educated and respectful travelers. And usually backpackers are. It is not just wanting to travel cheap. Travelling with a backpack is a state of mind. Is wanting for real an experience who let you live far from luxury, comfort and plans. 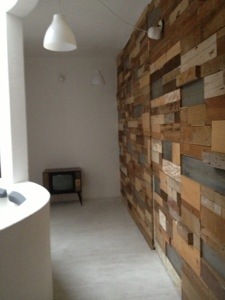 I am glad that nowadays more and more hostels are becoming more frequent and nice decorated. But few in the world are as nice as Stayinn. It is simply unique. The common area is decorated with 60´s and 70´s pieces, with a vintage LP player where you can listen to many of the vinyl hung on the walls. there was one from Lana del Rey and some more old school. From the staff I first met two lovely Mexicans: Enrique and Diego, just “the guys next door”, with trusty and warm smiles. And Delphine, a lovely girl from channel island, UK. She is realizing her dream of living in Mexico City: working at the hostel is helping her to make it. 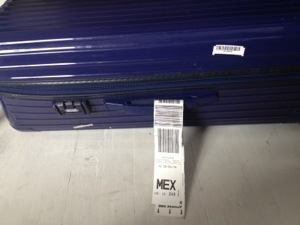 I was feeling so much at home in that place that I finally decided to stay some more days in Mexico city. I had already changed more than 10 beds and cities and I really needed some rest. I am sure this hostel is giving me the proper great energy I need to keep on with my trip. Finally, I m enjoying wandering around D.F., a city where I had been warned not to go to from most of the people especially in US. 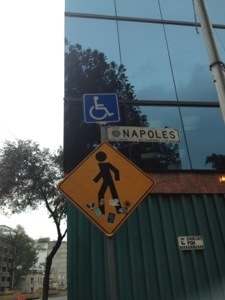 My first impression on D.F. was actually not that good, but I am sure it was influenced by previous comments. You can really feel that, despite being considered among the most dangerous capitals of the world, D.F. is changing a lot, you can see that there is the desire to be a better city, for what I could see in the different signs: “ciudad en movimiento”. I can assure you that it has much potential, I rarely felt such an energy in a city, comparable to a city like London or New York’s vibe. First of all I was surprised to see that in the center has been implemented the bike sharing system; most of the European capitals have adopted it as an important mean of transport, but it was still surprise to see them here, and even better that they are exactly the same of the Bicing in Barcelona, same shape, red and white. 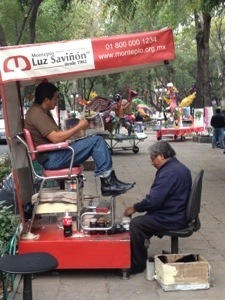 In the street you will see so many shoe shiners, called ” los boleros”, often chubby men with moustache giving a nice aspect to men shoes in exchange of few pesos. Meanwhile the client would be offered to read a big newspaper. I have seen the same scene many times, often with red and white tents or with a simple wooden box. It is quite an old tradition that started during the 30’s, when Mexican gentleman wouldn’t be allowed to enter anywhere without a perfectly shining shoe. 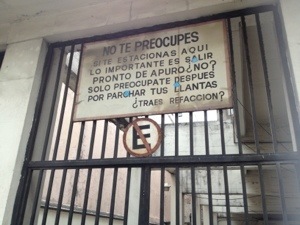 Communication in D.F. is very unique. Walking the streets and observing the walls you realize that whatever you want to express in this city, you just write it, even if you would not expect to read them black on white painted on a street wall. If a shop or restaurant were having legal problems, you would find it written as a big graffiti just beside the entrance. 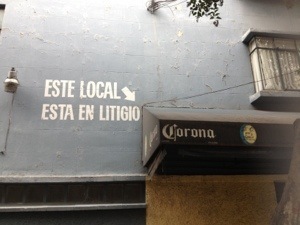 “Este local esta en litigio”. At the entrance of a parking you can find a threatening sign warning that if you leave the car parked in the wrong place, ignoring others spaces, you may have to care for deflated or broken wheels afterwards. Bizarre ! 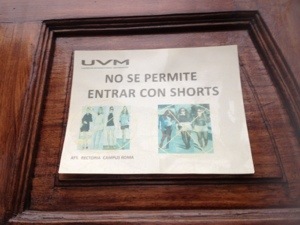 Also, at the main entrance of the Universidad del Valle in Colonia Roma, I saw an unusual forbidden a sign: ” shorts are not allowed” – with two pictures of girls in mini skirt and shorts and a big cross on it, indicating that you cannot wear them when at school. I had never seen it before. The “traffic light people” are also bizarre. 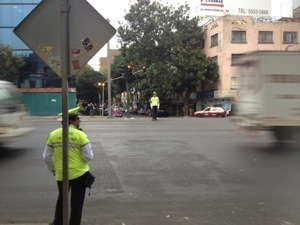 In big and small avenues you can find man or woman dressed in flashy yellow indicating you whenever you can cross or not the street, doing the job normally designated to traffic lights. 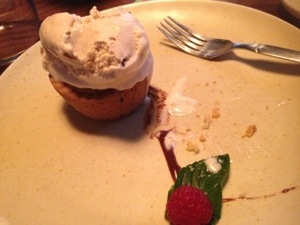 It was nice though, I liked it. Most of them were really kind and nice, and helpful when have to cross those crazy roads with crazier Mexican drivers. While walking back to the hostel I came across a street called Naples, that as you might already know it is my native city in Italy. 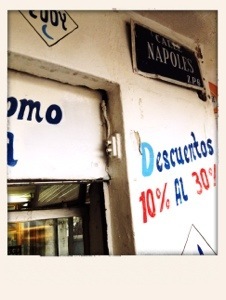 It is actually another Colonia; I took some funny pictures to send to my Neapolitan friends. 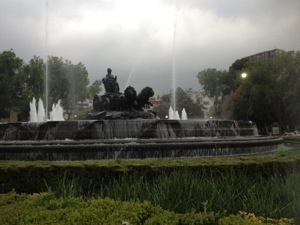 I walked down the streets with no map, and bumped into the Cybele’s fountain that made me remember of the one in Madrid. I also passed by a big mall called Palacio de Hierro, a kind of Selfridges in London and the Spanish el Corte ingles. Another bizarre thing I saw was the first pizzeria francese ever saw in my life. 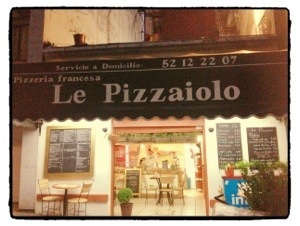 I come from the city of pizza and laughed when I saw it, especially for the name: le pizzaiolo. What do you think about using the French article ” le” and the Italian name for the guy who makes pizzas? Mexico City is full of art. 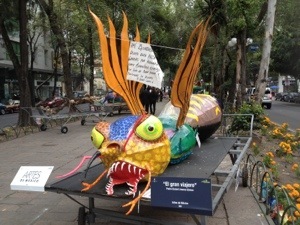 Paseo de la Reforma was full of multicolored monsters, an ancient traditional competition called “concurso de Alebrijes”. I particularly liked one called “el gran viajero”‘ from Spanish the big traveler. You might know why. I read that its artist had dedicated it to the great- grandfather, thanking him for having transmitted this great passion and art. I was impressed by the metro in D.F. : it is clean, really efficient and I can assure you that has nothing to envy to the underground in London or the one just seen in NY, with the difference that here it is extremely cheap, with a one way ticket for 3 peso less than a quarter dollar. A morning I decided to go for a nice walk in la Colonia Roma, coming across little squares and green areas. I stopped at a place where you can have a fresh, organic and healthy meal named Zumo y Sazon. I had a carrot, apple and orange juice and a salad, but broke my minimal effort of eating healthy by going for a coffee and a corncake with walnut ice cream at Belmondo Cafe: a lovely one, with nice atmosphere and decor. 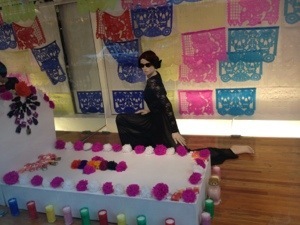 Shops around that area had nice display windows; I specially loved the one from American Apparel, which reproduced a tomb with flowers and skulls with a lady dressed in black at its feet. Of course the rest was full of colors. ” Eat like locals ” is my favorite quote when time to food when traveling. I enjoy trying new tastes. But I think that “Eat with locals” is even better, eating with those who might bring you to places where no guide would suggest you to go. He took me at “Bonito” restaurant, a fancy place really close to the hostel: a great choice. Everything was really tasty, but guacamole and cochinita de pibil tacos were simply delicious. I am glad at the end I didn’t have to delight a cow tongue; I wouldn’t have felt comfortable not to respect the “eat like locals ” rule. Few Corona´s and red wine just anticipated the rivers of mojito with tequilas I would drink afterwards, while dancing all night long at Pata Negra playing on doing and receiving “postdated” promises. Singing Eminem and trying to get all “Stan” precious lyrics from Dido while he was driving home was challenging, but I guess it was worth.